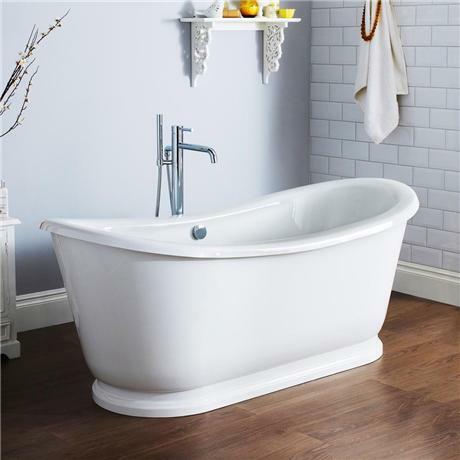 The Luxury 1750mm double ended slipper free-standing bath with skirt. Our luxury bath collection contains some of the most desirable bath designs available today. If you want to make a statement with your bath design, then choose from our luxury collection. Q. Would we need to reinforce the floor board with extra joists due the bath area due to size and weight of this bath? Hi, this bath is no heavier than any standard bath. I hope this helps, please let me know if you have any further questions. Q. Can this bath be painted? Hi Rachel, While we would not usually recommend painting this Double Ended Freestanding Bath, we have seen customers achieve results through carefully planned keying, priming, painting and sanding. However, we can not guarantee results, even using this method. Q. What type of waste would be required? Can the taps be mounted on side of bath? Hi Karen. The recommended waste for the Alice Slipper Bath is code E357 (enter this into oru search bar). This bath shouldn't be drilled for deck mounted taps, so we recommend looking at our freestanding or wall mounted bath tap ranges. Q. How think is the acyrlci from which this bath is made and is it reinforced? How much 'movement/give' is there when one gets in teh bath? Hi Anne, the thickness of this bath is 17mm, a twin skin of 5mm reinforced acrylic. There is no movement/give when getting into the bath.